We discussed the design of new enzymes in a previous Chembite, but what happens if you want to perform reactions with multiple enzymes that don’t necessarily get along together? Enzyme reactions work to perfection in their original biological systems because cells are compartmentalized, meaning they have smaller compartments within the overall cell that each accommodate specialized reactions with specialized enzymes that work in harmony. The same principles and conditions have to apply when enzymes are used for catalysis outside of their natural habitat or else the enzymes won’t work properly. So how do chemists design reactions with multiple enzymes? If they’re lucky, the enzymes will all work well together in bulk solution and they will get the product they’re looking for. However, in many cases, the products or reactants related to one enzyme will actually inhibit another enzyme, making the pathway very inefficient and in need of a different solution. The simple way to prevent this is to perform each enzymatic reaction separately in series, but this proves to be very time consuming and there are better approaches. These authors accomplish the task through compartmentalization using polymersomes, which are specially-designed polymers that can self-assembly in aqueous solution to form vesicles or hollow spheres, as shown in Figure 1. 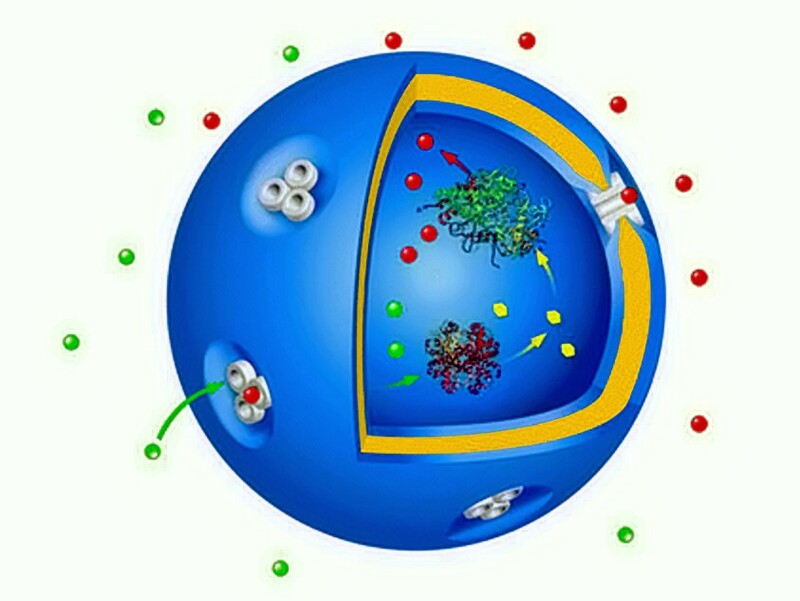 These vesicles can then act as nanoreactors by housing certain enzymes both on the inside and attached to the outer surface. The authors made the membranes permeable to specific molecules by incorporating porins, a type of membrane channel protein, into the polymer membrane. Figure 1: An overview of the enzyme cascade (A) and nanoreactor mechanism (B). As shown in Figure 1A, the molecule cytidine triphosphate (CTP) inhibits the activity of the enzyme AGE, so in order for this enzyme cascade to function properly, they need to be spatially separated. The polymersome by itself accomplishes this first step, but another crucial requirement for the system is the ability to let reactants and products related to the internal enzyme move in and out of the membrane to continue the cascade. The researchers cleverly incorporated membrane channel proteins into the polymerosome (shown in red), which allow the reactant (GlcNAc) to enter and the product (ManNAc) to leave while keeping everything else out and the enzyme in. Figure 2 shows that the reaction goes to completion with the compartmentalized system (2B) and does not when everything is free to float around in solution (2A). Figure 2: The reaction (black) proceeds to completion in compartmentalized system (B) but not in the bulk solution system (A). The white dots are at a low concentration of inhibitor, while the black is the whole reaction cascade with a large amount of initial inhibitor. The research shown here provides promising evidence that enzymes can act as powerful catalysts for the synthesis of complex molecules and that effective compartmentalization can be accomplished outside of a biological host to accommodate intricate enzyme cascades.